Hail to the King...it's Elvis day! 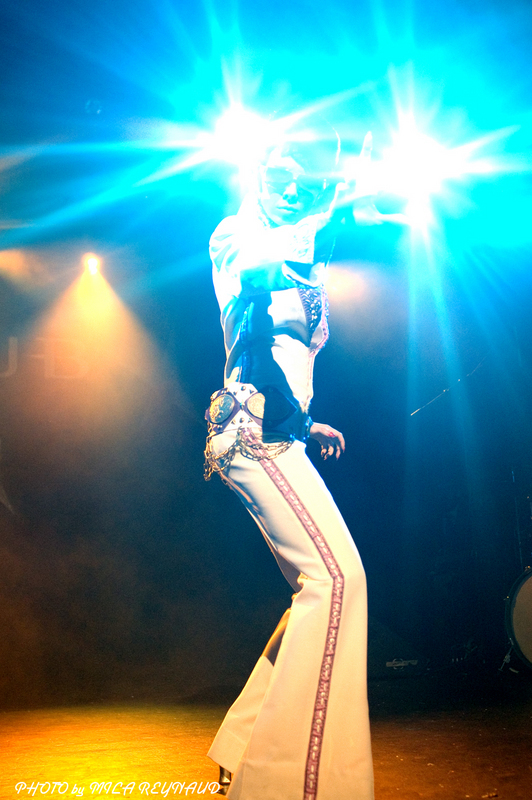 In honor of the 36th anniversary of Elvis' passing, I wanted to talk about why I do an Elvis tribute act, when most of my other routines fall more in the realm of hard rock and metal. I'm a big Elvis fan - especially of the gospel and country records of his Vegas years - but I actually put my Elvis act together after finding a beautifully made jumpsuit by his own tailor, Bill Belew, that was exactly my size...I couldn't pass up such a gorgeous costume! But doing Elvis has been much more than a tribute to an artist I admire. As a rock & roll burlesque dancer, learning his moves has been the equivalent of taking a ballet class, because his physicality (alongside Chuck Berry's) remains the basic lexicon of rock & roll in motion. Even though a sound like his isn't as common today, countless rockers still base their stage presences either upon Elvis himself, or upon other performers who were themselves influenced by him. Because of this, the King's moves have been a great foundation to build on for everything else I do, and they've continued to provide inspiration for my other choreography.